City's goals came either side of half-time as Leroy Sane chested home before Riyad Mahrez doubled the visitors' lead early in the second period. 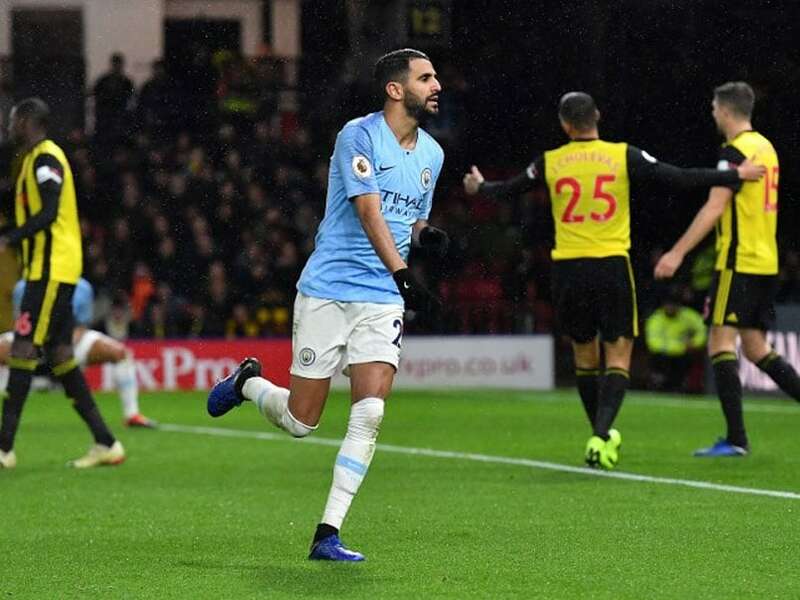 Pep Guardiola called on Manchester City to learn from a nervy finish to a seventh straight Premier League victory as a 2-1 win at Watford moved the champions five points clear of Liverpool at the top of the table. City's goals came either side of half-time as Leroy Sane chested home before Riyad Mahrez doubled the visitors' lead early in the second period. However, despite dominating for the majority of the game, Guardiola's men had to withstand a nervy finish after Abdoulaye Doucoure bundled in five minutes from time. "We have in mind the last minutes, (in) the last minutes anything could happen," said Guardiola. "I think we played 65-70 minutes at a top, top level. "After 0-2 we lost a little bit our control. We suffered, but that is what it is. "We have to learn from what happened in the last 20-25 minutes." Guardiola made six changes to his starting line-up despite also missing Sergio Aguero and Kevin De Bruyne through injury. Yet, City were still too strong for the dogged hosts with Watford thankful to goalkeeper Ben Foster for the visitors not racking up the 5-0 and 6-0 thrashings they did on their two previous visits to Vicarage Road. "When I came to London I thought Big Ben was in the city but no, he is in Watford for us," said Watford manager Javi Gracia. However, Gracia's side also had chances before the break against a City defence that appeared to miss Aymeric Laporte as the Frenchman was rotated for the first time in the league this season. "It was a good old Premier League game, as soon as they scored long balls start coming, they are extremely physical up front," said City captain Vincent Kompany. "We managed the game pretty well. You can't win every game playing fantasy football." Roberto Pereyra has already produced some spectacular goals for the Hornets this season and the Argentine was inches away from another when he curled just wide inside 10 minutes. Foster then made great saves to deny Sane and Mahrez when one-on-one, but the best stop of the opening half came down the other end when Ederson stretched out his left foot to block Troy Deeney's effort from point-blank range. City finally broke through five minutes before the break when Mahrez's cross picked out Sane unmarked at the back post and he cleverly used his chest to power the ball below Foster. Six minutes into the second half, the visitors struck again when Gabriel Jesus -- who endured another lean night in front of goal in the absence of Aguero -- at least made a contribution as a provider by pulling the ball back for Mahrez to fire home. City got uncharacteristically slack in the final quarter, though, and were made to pay when Doucoure finally turned home after a goalmouth scramble. Guardiola was forced to throw on Laporte and Nicolas Otamendi in the closing stages to repel Watford's aerial assault, but City held on. "They have dominated the game, they have created a lot of chances but I think we have done very good work and, at the end in the last minutes, we had some set pieces to try and get another result," added Gracia. Elsewhere, Bournemouth moved above Manchester United, who host Arsenal on Wednesday, up to sixth courtesy of a 2-1 win over Huddersfield thanks to early goals from Callum Wilson and Ryan Fraser to end a run of four straight defeats. "A lot of relief. It wasn't a vintage performance. At 2-0 you think we can go on but Huddersfield did very well and created chances. We defended heroically," said a relieved Bournemouth boss Eddie Howe. Brighton edged into the top half as despite playing for over an hour with 10 men after Shane Duffy's red card. They beat Crystal Palace 3-1 thanks to first-half goals from Glenn Murray, Leon Balogun and Florin Andone. West Ham's upward trajectory also continued as three goals in 12 second-half minutes beat Cardiff 3-1 with Lucas Perez scoring his first two league goals since a summer move from Arsenal.